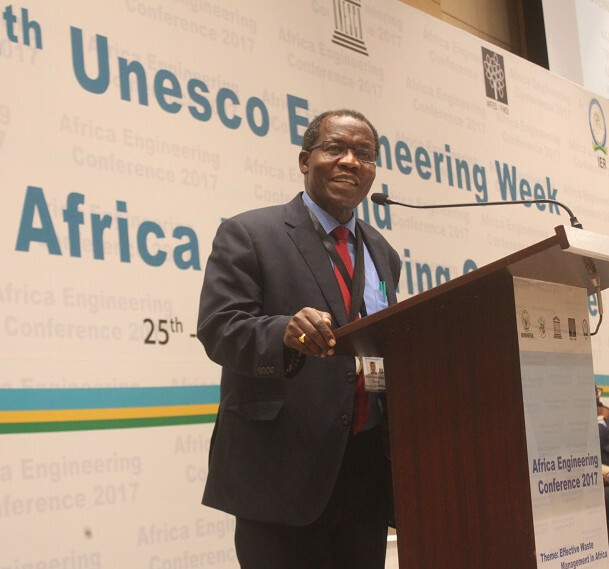 Every year is held the African Engineering Week, co-sponsored by WFEO and UNESCO. WFEO national members for South Africa (2014), Zimbabwe (2015), Nigeria (2016) and Rwanda (2017) and Kenya (2018) hosted and organized the last ones with FAEO support. In 2017 in Kigali WFEO has endorsed the theme “Effective Waste Management in Africa” which gives a clarion call for Africa to leap frog in its waste management and infrastructure delivery programmes to solve the challenges faced as a continent. Waste management is of major interest to WFEO especially the management of the disposal of industrial and mining waste and electronic gadgets dumping. WFEO has 18 national members in Sub-Saharan Africa Cameroon, Democratic Republic of Congo, Ethiopia, Ghana, Ivory Coast, Kenya, Madagascar, Malawi, Mauritius, Nigeria, Rwanda, Senegal, Sierra Leone, South Africa, Tanzania, Uganda, Zambia, Zimbabwe, and one international member: the FAEO (Federation of African Engineering Organizations). Nigeria, South Africa and Zimbabwe, are currently host of a Standing Technical Committee: respectively: Capacity Building, Anti-corruption and Women in Engineering, and, as such, their chairs are members of WFEO Executive Council. 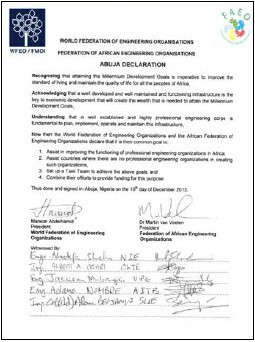 Federation of African Engineering Organisations (FAEO), as international member, headquartered in Nigeria, also has a seat at the Executive Council. 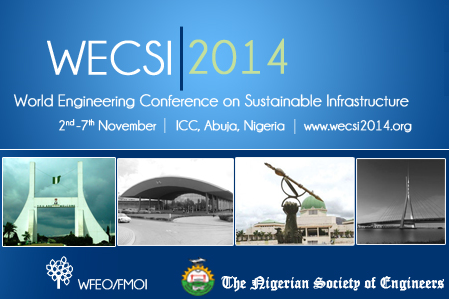 The 2014 WFEO World Engineering Conference on Sustainable Infrastructure was held in Abuja, Nigeria, hosted by the Nigeria Society of Engineers, and welcomed by the Nigerian government. As an international NGO with official partnership with UNESCO, WFEO is active in the NGO/UNESCO hydrology project, a program launched in Yamoussoukro, Ivory Coast, at the Forum on Access to Water for All in Africa in 2014. 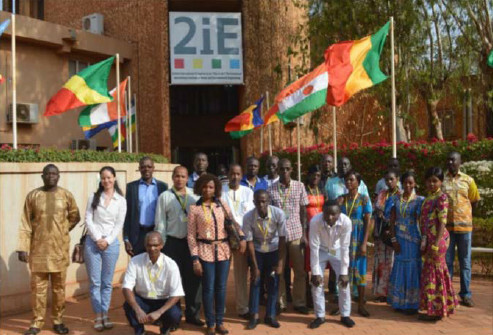 The project has resulted in a first call for projects in 2016, with the selection of NGOs from three countries (Congo DR, Ivory Coast and Madagascar), in order to fund the enrollment of 14 of their members in the 2IE hydrology school in Ouagadougou, Burkina Faso. The program was renewed for 2017 for six countries (Burkina Faso, Cameroon, Niger, Senegal, Chad and Togo).